For the past 24 years, The sisters of the Delta Pi Sorority hold an annual Ribbons and Roses Charity Auction to benefit the Princess Margaret Cancer Foundation. Throughout the years we have raised well over $55,000 for the Foundation. Due to this, several doves hang on the Princess Margaret Hospital Wings of Hope Dove Wall in the main entrance showing our contributions. Please join us on March 24th 2019 from 1PM-5PM to raise money through our live auction & silent auction. This day will be filled with entertainment, delicious refreshments, vendors and our keynote speaker & breast cancer survivor Freda Lochhead. This organization impacts the lives of so many cancer patients, their family and friends. Support them by coming out to this event in order for them to continue their meaningful work! All net proceeds including but not limited to ticket sales, silent and live auction will be donated to the Princess Margaret Cancer Foundation. PLEASE BRING: CASH OR CHEQUES TO THIS AUCTION. If you cannot attend auction but would like to still contribute, there is still an option to donate through this page! ITS THE MOST SINFUL YET SWEETEST TIME OF THE YEAR! Come out and party with the sisters of Delta Pi Sorority's Alpha Chapter at our 16th annual Sweetest Sin Party! Enjoy drinks, music and dancing this year at Spice Route (499 King Street W) on Saturday, March 9th! Cover at this venue is typically $20 but tickets purchased in advance for this event are only $10! Tickets are only valid until 12:30 AM so be sure to arrive before then to avoid having to pay an additional cover!! Tickets will be available for purchase online until 10:00 PM on March 9th - you must have your ticket or proof of purchase to enter. After 12:30 AM on the night of the event, if you have not purchased a ticket in advance you will have to pay $20 cover to enter. 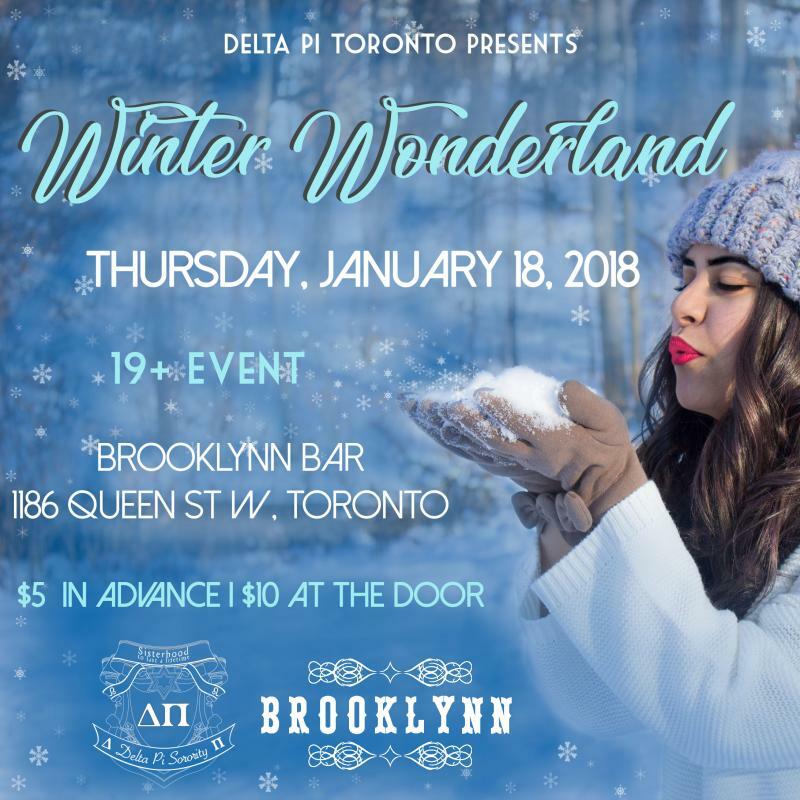 Come hangout with the sisters of Delta Pi at our 18+ Annual Winter Wonderland event. Are you sweet or are you sinful? Come out and party with the sisters of Delta Pi Sorority's Alpha Chapter at our 15th annual Sweetest Sin Party! Enjoy drinks, music and dancing at The Fifth Social Club (225 Richmond Street) on Saturday, April 7th! Cover at this venue is typically $20 but tickets purchased in advance for this event are only $10! Tickets are only valid until 11:00PM so be sure to arrive before then to avoid having to pay an additional cover. Tickets will be available for purchase online until 10:30 PM on April 7th - you must have your ticket or proof of purchase to enter. After 11:00 PM on the night of the event, if you have not purchased a ticket in advance you will have to pay $20 cover to enter. GET READY FOR A NIGHT YOU WON'T WANT TO MISS! IT'S DELTA PI'S ANNUAL WINTER WONDERLAND PARTY! Come out and celebrate with the sisters of the Delta Pi Sorority Alpha Chapter! Enjoy drinks, music, and dancing at Brooklynn Bar (1186 Queen St. W) on Thursday, January 18th! Tickets will be $5 in advance and $10 at the door. Plus, all tickets for Greeks will be $5. All Delta Pi sisters will be selling tickets so feel free to message any of us if you'd like to buy a ticket! Sending joy and well wishes to our loved ones this holiday season! 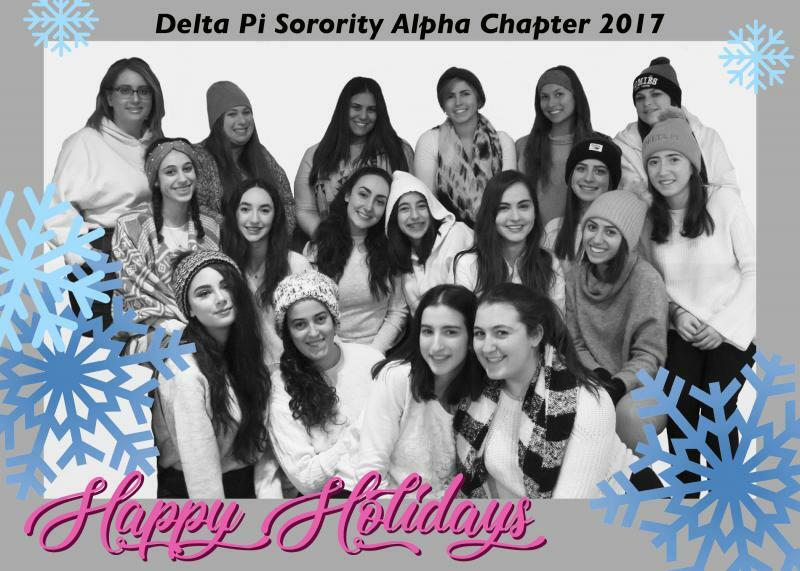 The sisters of Delta Pi's Alpha Chapter wishes everyone a happy and healthy new year full of success, good memories, and friendships! Find out at Delta Pi's annual Sweetest Sin party on Saturday, March 25th at the The Fifth Social Toronto.﻿ Tickets are $10 in advance. Sending love to our friends and family this holiday season! The sisters of Delta Pi's Alpha Chapter wishes everyone a happy and healthy new year full of success, friendship and love! Want to blow off some of that pre-exam studying stress? COME TO DELTA PI'S ANNUAL WINTER WONDERLAND PARTY! Come out and celebrate with the sisters of the Delta Pi Sorority Alpha Chapter! Enjoy drinks, music, and dancing at The Midtown (552 College Street) on Thursday December 1st! Tickets will be only $5 in advance and $10 at the door. Plus, theres a special offer available this year when you buy 5 tickers, you get 1 free! * Great Halloween costumes, ladies! The sisters and rushes had a great rush event tie-dying shirts and collecting non-perishable food items! The shirts turned out beautifully and all of the food items received were donated to the North York Harvest Food Drive. Thank you to all the beautiful ladies who came out to this event! We had such an amazing time celebrating 26 years with the Alumni of our sorority! We are so lucky to have such great sisters who are always supporting us in everything we do! Thank you all for brunching with us! 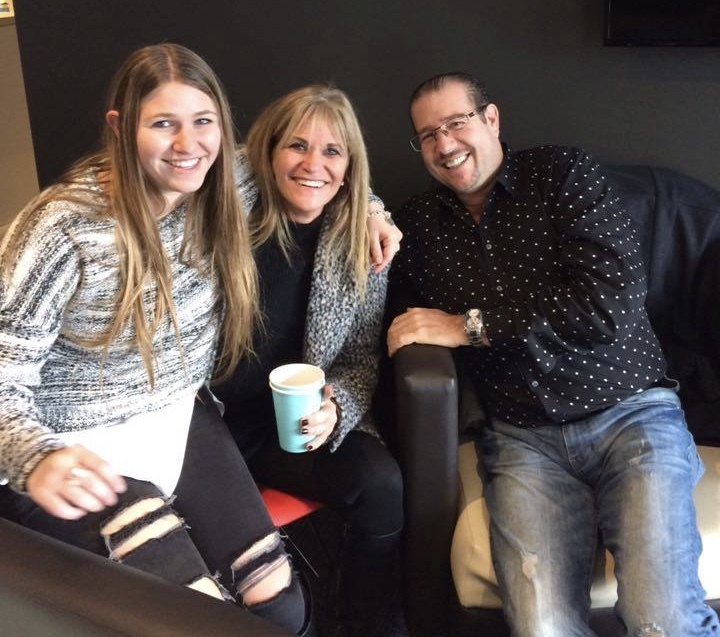 We are so grateful to have such amazing families! 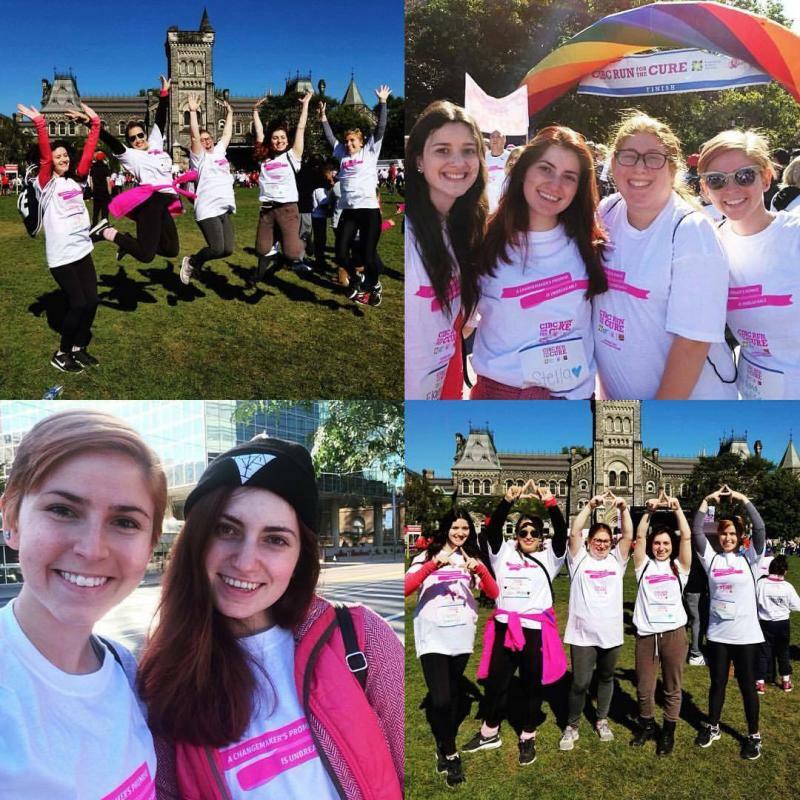 They support us in everything that we do and encourage us to be our best possible selves! Thanks for brunching with us! 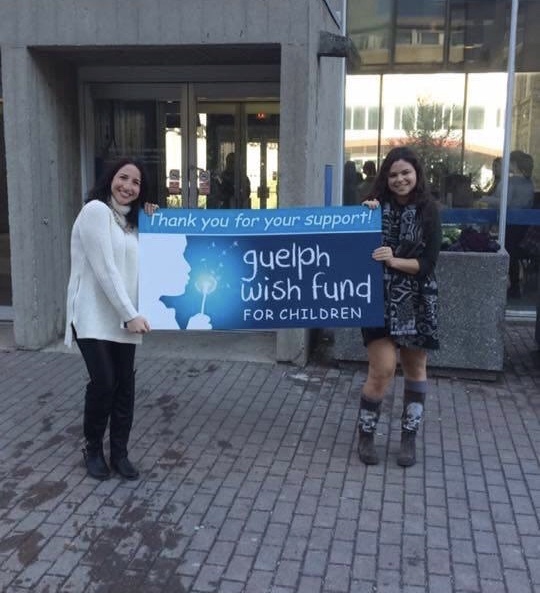 Our bake sale to raise money for the Guelph Children's Wish Fund was such a huge success. We raised over $300. We look forward to making this an annual event and raising awareness and funds for such an amazing cause! We had such an amazing time at our newly introduced Bonfire event with AEPi York! Thanks to everyone for coming out and sharing a s'more with us!